4-Word Review: The middle of nowhere. To an extent this is a one of kind film that is handled in such a raw and unpretentious way that it is like no other film you have ever seen before. The opening shot alone is amazing. You see a birdseye view of an isolated schoolhouse in the outback where our main character teaches. The camera then turns at a full circle and you see that there is absolutely nothing for miles in any direction. The desolation is mind boggling and it’s isolation at its purest. Not only does this very inspired shot get its point across, but it also becomes the essence of what the film is about by trying to get you to understand the ruggedness of its characters by immersing you into their environment. It’s an uncompromising film full of startling images. 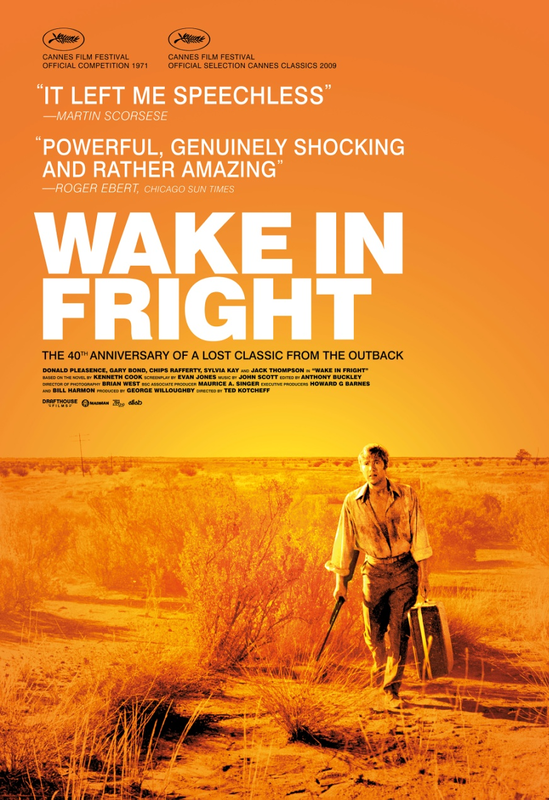 The story deals with a British schoolteacher John Grant (Gary Bond) who, through a loss in gambling, becomes trapped in the isolated outback town of Bundanyabba. He is cultured and educated and his sensibilities can’t mesh with the raw simplistic elements of the people in it. It’s a highly intriguing viewpoint that not only captures man’s ever daunting task at dealing with nature, but also the overall reality of his existence and even himself. It makes you feel you are right there experiencing the same onslaught with him. There are also some interesting low key scenes proving that one of the biggest hurdles one must fight when in these places is actually just the boredom. I do have to warn readers that the film has a very prolonged brutally explicit kangaroo hunting scene that features the actual killing of the animals. It even shows the men physically beating up on some wounded kangaroo’s and then viciously slashing their throats in a mocking fashion. Although I do feel that these scenes leave the viewer with the intended strong, raw impact and I like the lighting during the nighttime hunt that allows for a surreal element I still admit this may be a very difficult watch for some and may turn them off from viewing the film altogether. Apparently there were quite a few people that walked out of the film during this scene when it was shown at the Cannes, so be prepared. Star Bond is excellent. You can relate to his anger and defiance at being somewhere he doesn’t want to be as well as feeling his desperation, exhaustion, and eventual surrender. For many years this film sat in almost virtual obscurity, but after an exhaustive worldwide search a print of the film was finally found in the back of a Pittsburgh warehouse in a canister with a ‘to be destroyed’ label on it. Fortunately the print was saved and the restoration process is fantastic with colors that are bright and vivid. Director Ted Kotcheff captures the region in all of its rustic, desolate glory including the incredible crystal blue sky. Reportedly many Aussies dislike the film as they feel it creates a negative stereotype. However, I don’t see it that way. I love the county and people and consider this more of a portrait of what happens when people are stuck in an isolated environment, which technically could be anywhere. This entry was posted in 70's Movies, Action/Adventure, Drama, Exploitation, Foreign Films, Moody/Stylish, Movies Based on Novels, Movies from Australia, Movies with a rural setting, Outdoors and tagged 70's Movies, Donald Pleasance, Drama, Entertainment, Gary Bond, Movies, oscars, Review, Ted Kotcheff. Bookmark the permalink. Man this film has been everywhere on the Net the last month or so!